Students: Looking for Help with Canvas? Search the Canvas Student Guide (updated every three weeks). Explore Getting Started with Canvas to familiarize yourself with using Canvas as a student. 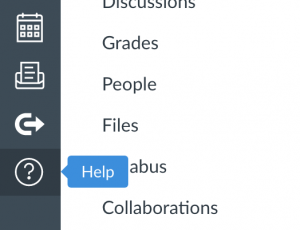 Click on the Help link at the bottom left of any Canvas course menu to search the Canvas Guides for quick answers to common questions without leaving your course site. Contact the OIT HelpDesk online or at 865-974-9900 to request help with nearly any issue you are having with Canvas. At some point or another during your time as a UTK student, you’ll likely need to take a Canvas Quiz. Make sure things go smoothly with these Tips for Canvas Quizzes.